little bee books, 9781499801743, 32pp. 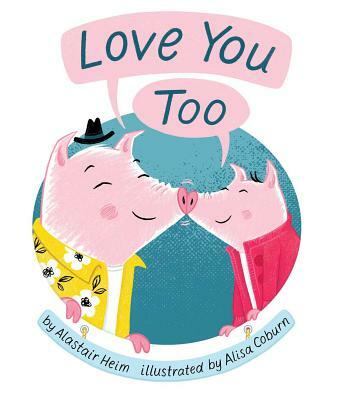 A sweet, interactive picture book about a father and daughter's fun day! When I say I love, you say you! When I say love you, you say too! It’s another bright morning, and there’s a whole day of fun activities ahead! Over the course of a day, a father and his little piglet wake up, get dressed, eat pancakes with syrup, ride bicycles, go on the swings, eat lunch, play hide-and-seek, take a bath, and then get ready for bed, eager for the next day to come. This rhythmic call-and-response picture book is an entertaining and interactive reading experience perfect for children who like hands-on books. Kids will love reciting the text when prompted with "When I say pancakes, you say more. . . . When I say syrup, you say pour. . . . When I say swing me, you say high. . . . When I say to the, you say sky," and more! Alastair Heim’s love for writing started in the 9th grade, when a poem that he wrote won second place in a statewide poetry contest. Years later, his then three-year-old daughter began repeating every word he said. This inspired him to write a bedtime story in which they could both participate. Alastair lives in Missouri with his wife and three word-repeating kids. Alisa Coburn is an illustrator and designer who lives with her family in the English countryside. She loves to draw and color as much as she did when she was a little "piglet," and she can't believe that she gets to do this for a living. Find out more about Alisa at alisacoburn.com.